The 10th anniversary celebrations at Mr Green Casino have delivered some cracking prizes and it’s fair to say that the latest giveaway is an absolute gem. Literally. 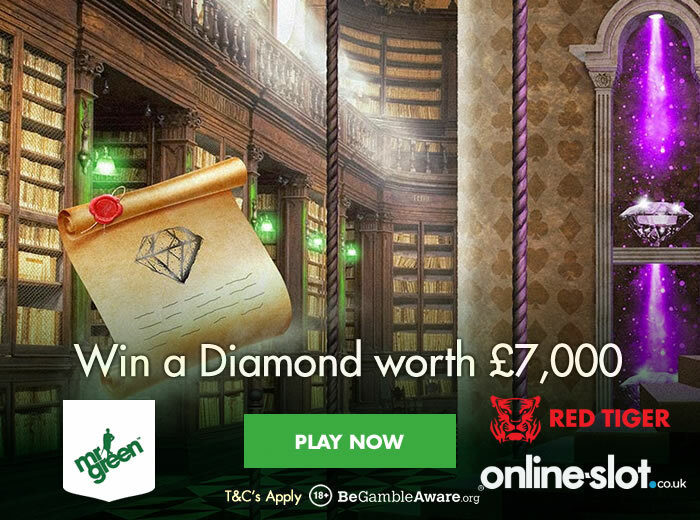 The gentleman gambler will be awarding 2 diamonds worth £7,000 apiece as well as plenty of free spins in its Bygone Books promotion. To take advantage of this dazzling offer, just get spinning on the special selection of Bygone Books slots from Red Tiger Gaming listed between now and 10:59pm on Thursday the 6th of September (2018) – you can choose between Laser Fruit, Dragon’s Luck, Ra’s Legend, Treasure Mine and the exclusive Lucky Mr Green. Every £40 wagered on these slots will activate a 30-second blast of unlimited free spins. You can collect up to 3 minutes of free spins every day during the promotion. The 2 players who wager the most during the whole of the qualification period will each win a diamond worth £7,000! Our pick of the qualifying slots would be Lucky Mr Green. It’s a 5 reel, 20 payline slot from Red Tiger Gaming that’s dripping in jazz age splendour. The art deco design is superbly done and has the feel of a Mayfair gentleman’s club or high roller casino. There are plenty of extras on offer as far as gameplay goes too, starting with the quartet of modifiers that can hit on any spin. This can result in all the lower value symbols being removed from the reels, a massive 3×3 wild being added, plenty of extra wilds or a multiplier boost of up to 20x. The game also comes with a free spins round and a cash trail bonus. Pick from the bowler hats shown to work your way along the trail. If you make it all the way to the finish you could end up pocketing a massive prize of some 800 times your stake. With terrific design and plenty of variety in the features, there’s plenty to like here. If you like your slots to come with luxury and glamour, then Lucky Mr Green offers it in spades. Play Lucky Mr Green over the next few days and it could get you plenty of free spins and even a diamond. New players at Mr Green are eligible for an exclusive 20 no deposit spins on NetEnt’s Starburst, a bonus of up to £100 as well as 100 more free spins. Also on offer are 5 free spins for the 20 days that follow.